I created these guys specifically to backup Sanvill when he confronted my characters. They are essentially cyborgs – or servitors in Divinity speak – a living brain encased in a robotic body. Gift of the Machine God. 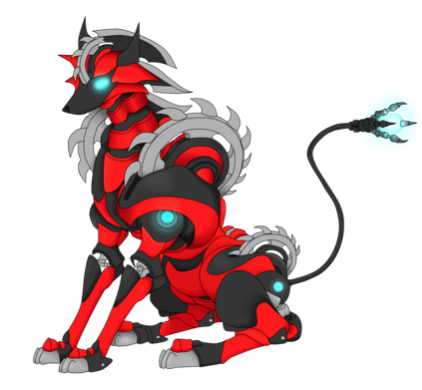 As a creature of technology K9’s gain many damage and condition residences and immunities but they are also susceptible to electrical attacks. Keen Hearing and Smell. The K9 has advantage on Wisdom (Perception) checks that rely on hearing or smell. Pack Tactics. The K9 has advantage on an attack roll against a creature if at least one of the K9’s allies is within 5 feet of the creature and the ally isn’t incapacitated. Bite. Melee Weapon Attack: +5 to hit, reach 5 ft ., one target. Hit: 7 (1d8 + 3) piercing damage plus 7 (2d6) plasma (fire and electrical) damage. Plasma Blast (Recharge 5-6}. The K9 exhales plasma in a 15-foot cone. Each creature in that area must make a DC 12 Dexterity saving throw, taking 21 (6d6) fire and electrical damage on a failed save, or half as much damage on a successful one. These wolf like creatures are not true robots but are actually animal brains slaved to a cogitator and placed in a mostly mechanical body. These are not from the dark-age of technology but are specialised tracking and hunting servitors (cyborgs instead of true robots).